BECKHOFF Automation presents the AM8800 series of stainless steel servomotors in a ‘hygienic design’ for use in the food, chemical and pharmaceutical industries. The new servomotors supplement the highly-dynamic motors from the Beckhoff AM8000 series with a stainless steel finish version. The hygienic design of the AM8800 stainless steel servomotors allows implementation in extremely harsh or corrosive environments. 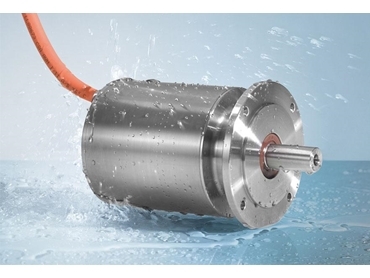 Technologically, the AM8800 stainless steel motors are based on the Beckhoff AM8000 motor series but feature an all stainless steel housing in AISI 316L designed according to FDA guidelines as well as a stainless steel motor shaft. Corners and edges were avoided while drill holes and screwed connections were largely dispensed with during the motor design process in order to prevent the accumulation of dirt. Implemented in B5 form, the flanges are compatible with the AM8000 series flanges, further simplifying the conversion of existing plants.